A strong selection of spacious bungalows helps to make the long-running Vongdeuan Resort a reliable midrange favourite. Ad Book now! Rates from US$82++. Average rating 7.8 from 5,850 reviews. Culminating at a big beachside swimming pool, the freestanding rooms are spread over a huge chunk of tree-lined land that was mostly preserved when concrete stacks were packed into the other end of the beach. The well-kept bungalows come in four different styles, each with a private bathroom and terrace. 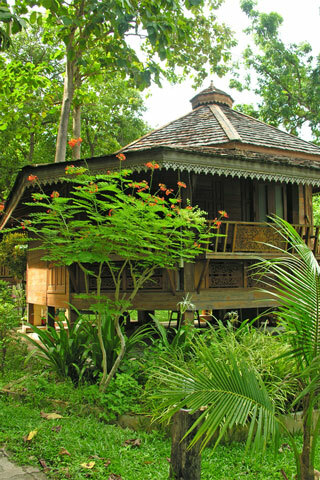 Closest to the beach and punctuated by tropical flowers, the large Thai-style wood bungalows come with carved wooden eaves and some were designed in a hexagon shape. With soft white curtains draped over several windows, we felt that the Thai-style rooms are the best of the bunch. Further up the hill are some modern-style white villas that come in a few different sizes, all with tile floors and large windows. Some rooms have flush white walls and floors to go with light-blue bedspreads and wall hangings; others have wood walls along with soft lighting and four-poster beds. All rooms are equipped with air-con, fridge and large TV, though WiFi may only work in the common area. Within steps of the sand, loungers surround the pool as part of a large light-yellow concrete structure that also hosts a coffee shop and restaurant. The experienced staff offers kayaks, Thai massage and boat trips. Immediately after inquiring as a walk-in and receiving the rates listed below, we found rates for around 500 baht cheaper on Booking.com. Vongduean Resort sometimes fills up with Thai holidaymakers; in that case you could try the neighbouring C Samet Beach Resort (formerly Vong Duern Villa), or head up the beach to Samed Cabana. Check rates at Vong Deuan Resort on Booking.com.